Restoril - What is it? How is it Abused? What are the Treatments? Restoril – What is it? How is it Abused? What are the Treatments? 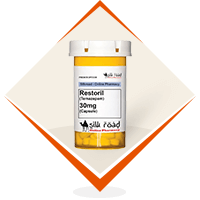 Restoril is a popular brand name for temazepam, produced by the Mallinckrodt Pharmaceutical Group. It belongs to the family of benzodiazepines (also known as benzos) like Xanax, Ativan, and Valium. Furthermore, this drug has similar chemistry to these drugs and commonly prescribed to treat anxiety. In addition, like others, it inhibits brain activity by increasing a brain neurotransmitter called gamma-aminobutyric acid (GABA). As a result, this drug eliminates the feeling of anxiety and induces sleepiness or feeling relaxed. There are also several non-benzodiazepine alternatives like Ambien. Therefore, the drug is categorized as a Schedule IV Controlled Substances. This means they have the potential to be highly addictive, but allowed for medical purposes. Presently, this drug usually comes in the form of capsules with strengths of 7.5 mg, 15 mg, and 30 mg. As far as it is a prescription medication, anyone found to be in possession without a prescription could face legal actions leading to imprisonment and fines. Initially, doctors prescribe Restoril as an anti-anxiety medication, but also to people with sleeping problems like insomnia. Incidentally, to people aged 65 years old and above, they give a initial dosage of 7.5 mg and is adjusted depending on one’s need. In fact, based on the drug’s manufacturer, patients with insomnia is getting an average of 7 to 8 hours of sleep after taking these sleeping pills. What are the risks of taking Restoril? What drugs to avoid while taking Restoril? What are the symptoms of Restoril overdose? What to know about Restoril addiction? How to treat Restoril addiction? Firstly, the intake of Restoril can result in drug addiction. People under this drug prescription could develop high tolerance within the three days of consumption. As a result, it prompts them to take more to achieve the desired effect. Therefore, when an individual shows signs of addiction to Restoril, expect the withdrawal syndrome to be a painful process. Additionally, there are also cases wherein some people taking Restoril could develop allergic reactions to it. Consequently, it can lead to anaphylaxis, a fatal syndrome where the throat shuts down, and the person will experience difficulty in breathing. Among the allergic reactions to watch out for are swelling of the face, lips, eyes, throat and tongue. While some complain hoarseness, rash, and hives. If this occurs while taking Restoril, stop and seek immediate medical assistance. Doctors also do not prescribe Restoril to pregnant women because it could result in birth defects. What drugs to avoid when taking Restoril? What is a drug interaction major rule to follow while taking Restoril? This drug slows down a person’s rate of breathing, metabolism, and heartbeat. Furthermore, patients should not combine this drug with other stimulants that do the opposite. As a result, it could worsen your condition like depression and lead to bodily harm or overdose. If you are taking Restoril for a week, take it only at bedtime, this will not cause addiction as far as it is a fast acting drug and leaves your system relatively fast. In any case, the problem of addiction arises when the person under this medication abuses it and mixes it with other substances like alcohol to get “high”. Presently, people with addiction problems take it to reduce the side effects of other drugs. For example, a cocaine user will be given temazepam to treat his or her anxiety and feeling of agitation. First, addiction starts when the person uses it for other purposes outside medical. It includes recreational uses to get the high effect and feeling of relaxation. Then, tolerance to this drug could develop quickly and lead to addiction. Quitting must not be done cold turkey and without medical supervision because the withdrawal syndrome may have dangerous effects. One should treat anyone with addiction in a hospital or drug rehabilitation facility with the presence of medical professionals and therapies. For example, one of the most recommended forms of treatment for people with addiction is admission into a residential facility. Consequently, the patient will stay there and undergo a series of medical and therapeutic treatment 24/7 for a few months or more. This depends on one’s level of addiction and length of usage. Here, the admitted patient will undergo detox. Moreover, they will attend private and group counseling, join activities that will teach them life to form skills to cope with the trigger factors. In addition, they will get into shape through sports and learn to live a normal life free from drugs. No doubt, the whole addiction treatment program aims to help patient fight the intense cravings and avoid a relapse. Part of the treatment is the aftercare program. This is where the patient is advised to attend regular counseling, group sessions and support from both the community and addiction treatment services after returning to his or her home. Addiction Resource » Addictive Substances: The Anatomy of Drug Addiction » Restoril – What is it? How is it Abused? What are the Treatments?